Fuzzball & Scuzzball - The Savagery of Sally Serpentine! Comic 275 - The Savagery of Sally Serpentine! Two comics this week, instead of one. Get excited! Almost a year ago in episode #222 I pointed out that, for the first time, a panel of this comic had passed the Bechdel Test. 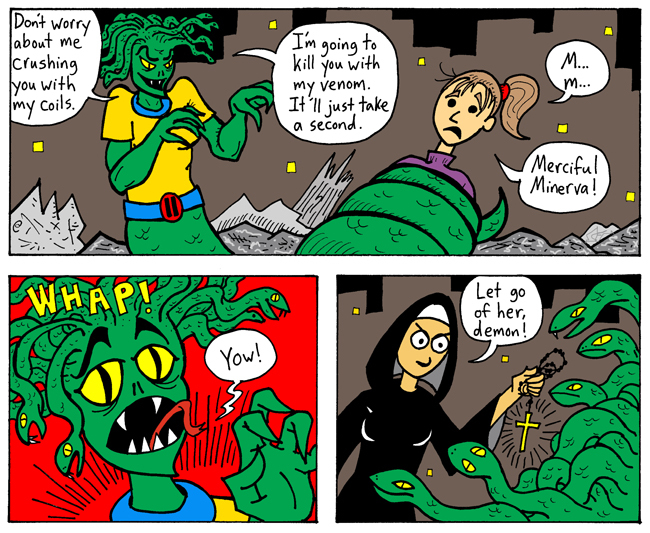 Now, today, for the first time, I have an entire strip that passes the Bechdel Test. I know, it's a really low bar to clear. Anyway, last we saw Sally Serpentine and Hannah Hanover, Sally had knocked Hannah to the ground. It looks like things have not gone well for Hannah since then. Incidentally, I've given QAGS stags for both Hannah and Sally, so if you want you can get a copy of QAGS and some dice and play out their conflict. But! How is Sister June going to fare against Sally Serpentine? You don't have to wait a whole week to find out . . . tune in on Thursday to see!